I’ve mentioned it before: when it comes to some aspects of building construction, I’m a bit of a child. I just love to watch buildings get torn down. Using dynamite? Love it. Tearing it apart with a giant backhoe? I’m there. Carefully deconstructing it by hand? I’m good with that. However they do it, the little kid in me just loves to watch workers taking old buildings down. Nowadays, buildings are carefully deconstructed, with the various component elements—metal, wood, concrete—carefully separated out and recycled. I’m too old to have watched those videotapes (yes, videotapes) that showed heavy equipment working on building job sites, although my kids did (and I might have peeked). But I don’t need tapes when all around us there are real-life examples of heavy equipment tearing down and then eventually constructing new buildings. Construction is fun to watch, too, but it happens so slowly. Deconstruction—at least for the typical one or two-story buildings so common around here—happens in a handful of days. Combined the properties total some 8.4 acres in size. Stanford will be building a complex that is a mix of housing and office space, plus a small amount of retail. There will be four residential buildings (two of which will be connected) ranging from three to five stories in height. Altogether they will contain a total of 215 apartments, ten of which (or possibly eight, depending upon the fate of a separate project elsewhere in the city) will be made affordable to those who qualify at the Low income level. Middle Plaza will also include three “non-medical” office buildings, for about 143,000 square feet of space. And on the ground floor of one of the office buildings there will be about 10,000 square feet of space for either retail or restaurants. Middle Plaza is presumably named for its one large public feature: an open plaza located right about where Middle Avenue dead-ends into El Camino Real. The development will take advantage of the signalized intersection at El Camino and Middle Avenue, adding a fourth “leg” to the intersection that will be the automobile entrance and exit to the property. The drive will angle back towards the Caltrain tracks, at which point it will turn and run parallel to them, terminating at (or in) the Stanford Park Hotel’s parking lot. With one exception, the underground garages that will service this project will be accessible from this rear driveway, meaning that cars entering and exiting the buildings will all funnel through the Middle Avenue intersection. 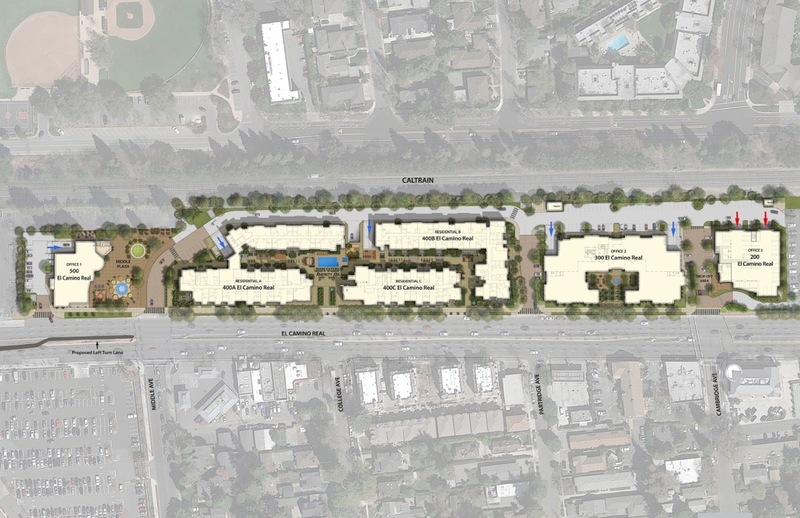 The one exception is for the garage beneath the smallest office building (the one that will include the retail space), which is located just north and east of the intersection; cars will access that building using a separate driveway off El Camino, a driveway that will be immediately adjacent to the one that leads into the Big 5 Sporting Goods store parking lot. Menlo Park is apparently considering adding a grade-separated crossing in this area, allowing pedestrians and cyclists (but not cars) to tunnel beneath elevated Caltrain tracks. One nice benefit of the Middle Plaza project is that it will provide the needed connection between the El Camino Real/Middle Avenue intersection and this possible new crossing, which would then lead to Burgess Park. Demolition of the old dealerships should be complete in September (the buildings are pretty much gone already, but “demolition” presumably includes hauling everything away and perhaps re-grading the land, which will take some time). Construction will begin immediately thereafter, and will run well into the year 2021. Building occupancy is scheduled to take place sometime between late 2020 and the summer of 2021. I don’t know in what order they will tear down the remaining buildings on this block, but everything out to El Camino Real and up to (but not including) the Security Public Storage buildings you can see in the above picture (the tall one with the orange stripe, and the ivy-covered shorter one) will be torn down. 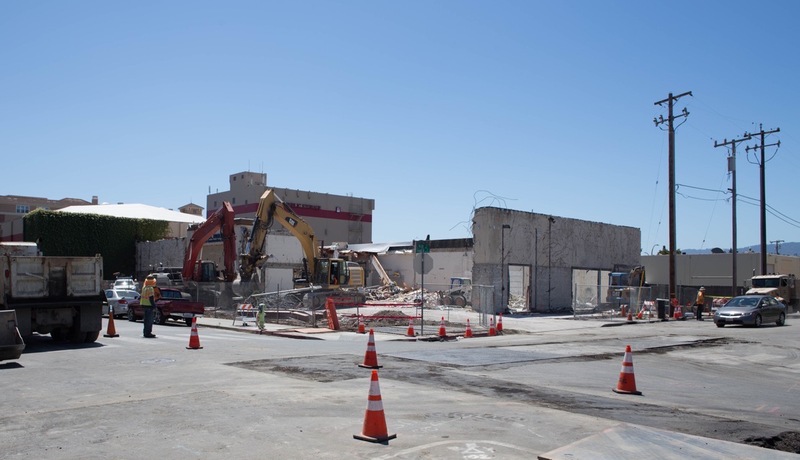 This means that the small La Mancha Plaza retail space on the corner of El Camino and Diller, as well as the old Sequoia Veterinary Hospital that sits next door, will be gone any day now. 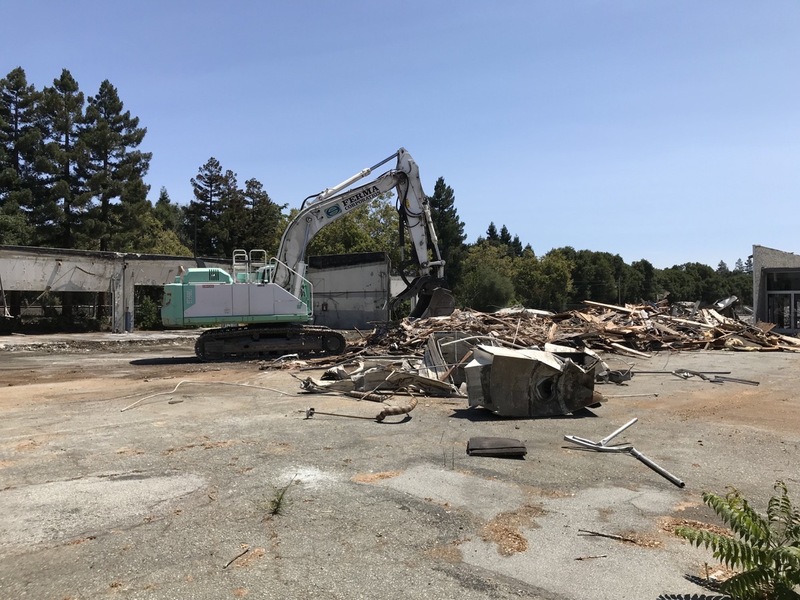 While I was walking around the block to see what was happening I did notice that some of the large trees that stood near the Sequoia Veterinary Hospital have already been taken down. As well, I noticed some activity on some of the older buildings that was consistent with something that one of my readers mentioned: that there is some asbestos in one or more of those old buildings. Thus, I don’t expect the large backhoe in the above picture to be tearing into all of those other buildings right away: any asbestos, if present, will need to be carefully removed first. But keep an eye on this property: Greystar has the necessary permits to tear everything down and begin construction on the 350-unit apartment building that will soon occupy this block. Not yet started, because their permits are still being reviewed by the city, is the 33-unit townhouse complex that will be built by KB Homes on the site where until recently Honda Redwood City was doing business. I had predicted that KB Homes would likely move very quickly on their project once Honda Redwood City had completed their move to San Carlos, and it appears that I was right: KB Homes applied for construction permits back in February and have been working with the city to get those permits issued ever since. The city approved some sort of demolition permit for the property in mid-May, so presumably KB Homes could begin the demolition process any day now. However, they may be waiting until they have their construction permits in hand as well. Just after Honda Redwood City moved out, the property was cleaned up a bit and then a construction fence went up. This fence didn’t surprise me: developers often do this to keep trespassers out of unoccupied buildings. But one small thing did give me pause: at the base of that fence is what is apparently referred to as “straw wattle”: compressed straw “worms,” around 25 feet long, that are used to absorb liquids and keep them confined to an area. I wonder if during the demolition of the main showroom the contractor plans to keep the building (and the debris) watered down, to minimize the amount of dust in the air. The straw wattle would help keep much of that water from flowing into the street and thus into the storm drains. At first I thought it might have something to do with asbestos removal, but I’m guessing that the main building, shown above, is too new to contain asbestos. The nearby parts building, though, apparently does, since there are “Danger—Authorized Personnel Only” signs warning of asbestos affixed to its doors. The straw wattle stops short of the parts building, so perhaps the asbestos is confined to the interior of that building and can be safely removed without water spilling outside the building. I’m eagerly watching the two Redwood City properties on El Camino Real where demolition is taking place (or is soon to take place). Fortunately for me, both 1409 El Camino and the former Honda dealership at 601 El Camino are within easy walk of my house and are often on the way when I’m out taking my walks. With the Honda dealership in particular I may well do something I’ve always wanted to do, which is to take a camp chair and sit for a couple of hours watching and photographing the glorious destruction. Sure, it’s a little silly, but it is something that the little boy inside me would love to do—and sometimes you just have to indulge your inner child. Any thoughts or knowledge of what the lot that contains Safeway near Sequoia Station is going to be in the up an coming years. How long is that lease that Safeway has? That is a prime location and seems to be a total waste of land given its current use. I am not aware of any changes coming to the Sequoia Station shopping center in the next several years. The city has visions for that large property to be broken up into smaller blocks someday, but I am not aware that those visions are anything more than just ideas for a future day in which the owner of the center is ready to get rid of it. At one point the city was dreaming about building a circular park (“Depot Circle”) within a roundabout just across the tracks from the center, with a hope to extend Hamilton Street across the tracks and through the middle of today’s shopping center. But with the construction of the “Box” buildings, that idea went by the wayside, and we instead got the triangular “North Plaza”, which sits on the north side of the Box buildings and is where Cru is located today. Sequoia Station certainly is a prime piece of land, and a lot could be done with it, but it sure seems awfully busy right now, so I’m not sure I’d classify it as a “total waste.” Given that most of it is a large surface parking lot, sure, it could be used more efficiently, but I’m guessing it isn’t going anywhere anytime soon. OK, I’ve heard everything now. 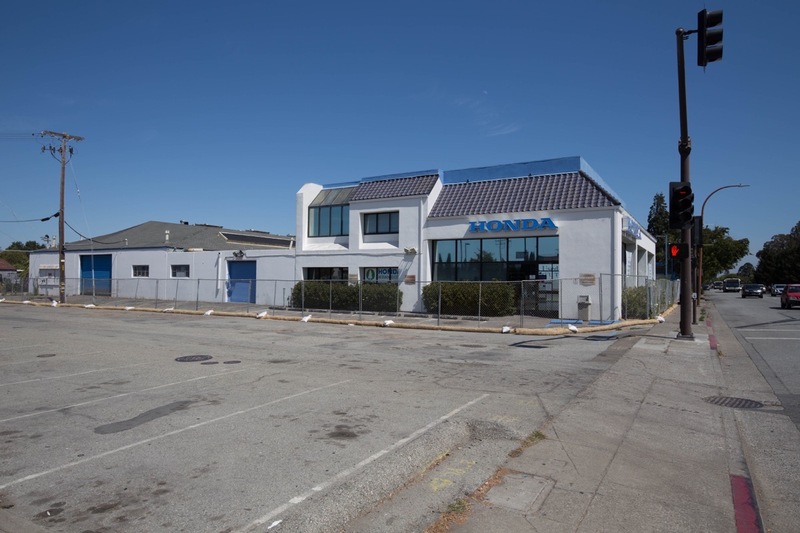 A strip of car dealerships – let alone long-vacant ones – sandwiched between the Caltrain tracks and an unused sidewalk along the traffic sewer that is El Camino … contributed to Menlo Park’s “charm”!? Speaking as a native, thinking back for nearly a half century, nobody I can think of would’ve at any time dreamt of listing that strip among Menlo Park’s “charms.” It seems some people will say almost anything to decry infill redevelopment. Oh, I think it was a real tragedy when the car dealerships closed down. But after all these years of seeing those empty dealerships going to ruin, I personally am just glad that something is finally replacing them. I do see your point about progress being painful, and do agree to a point, but that has to be balanced with the need for new housing, etc. Our world is changing, whether we like it or not, it seems. We bought our Geo Prism in 1994 from Anderson Chevrolet and still have the car. I remember being driven to work in their shuttle van. Traffic in Menlo Park is already atrocious. I can’t imagine how they are going to mitigate all the new cars. Traffic in Menlo Park certainly does have its challenges. Not being a resident of MP I can’t speak to much more than El Camino, but there seems to be about three or four long blocks of El Camino that are a real logjam in the morning and the afternoon/evening. I’ve always wondered what the problem is, given that it flows pretty easily on the Atherton and Palo Alto ends. Redwood City, San Carlos, and Belmont (and many others, I’m sure) have similar problems in certain areas, making me wonder if it is a problem of signal timing or something. In any case, adding more cars certainly won’t help. But even without the additional cars, the problem already exists and really needs to be dealt with.